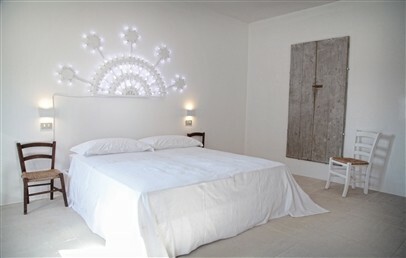 Masseria Prosperi is located in Frassanito, a relaxing countryside location in the province of Otranto. 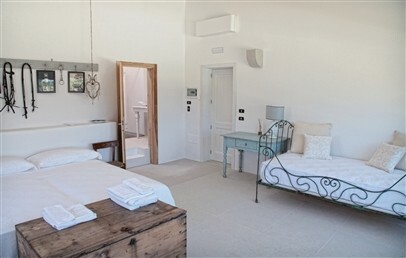 Surrounded by a manicured garden, the farm is just a few kilometers away from the coast and beautiful beaches of Salento: Lido Tropea (2 km), Lido La Castellana (12 km approx.). Nearby, you can visit Calimera Natural Museum, “Must” the museum of Contemporary Art in Lecce and the Museum of Maglie. The whole province of Otranto boasts also many fine restaurants and “osterie” where discover the delicious local cuisine. The closest airport to the Masseria Prosperi is the Brindisi Airport in 80 km distance. 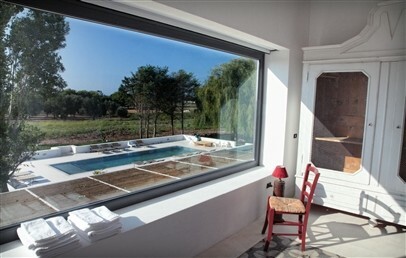 Masseria Prosperi follows the slow philosophy based on the knowledge and respect of nature and landscape. 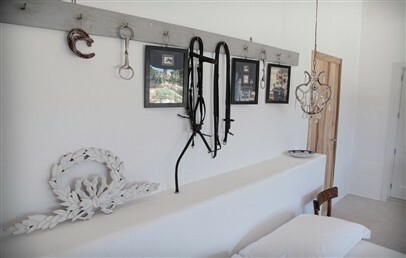 The whole farmhouse has been restored as well as every single object and detail. 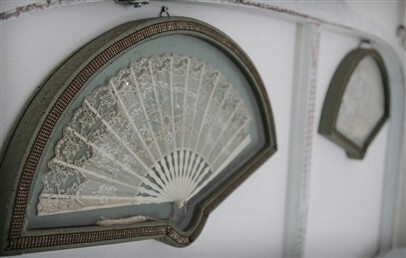 The style is refined and stylish, but at the same time, the ancient rural atmosphere is still alive. The hotel consists of only 6 rooms, a dining room, kitchen, Turkish bath, indoor pool with salty water and whirlpool, massage room and aquabikes for guests use. In the garden, there is a large swimming pool, the riding horse and some lounge and common areas where get in touch with the many farm animals. 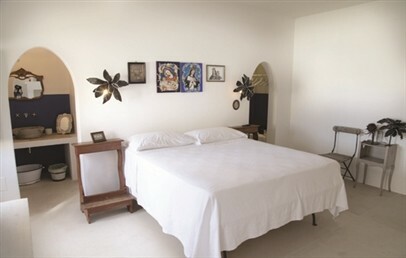 The 6 rooms are all different from each other in size, view and position. They are all cozy and equipped with minibar, satellite TV, Wi-Fi internet connection, iPod or USB Key audio system dok station, air conditioning and floor heating, bathrobes and complimentary toilet products that are not tested on animals (LAV certified: Anti-Vivisection League). The nearest beach is Lido Tropea, 2 km away and easily reachable by car or by taxi (the cost is around € 10 per way with a max. of 7 people per way). It is a sandy beach and has a gently sloping sea entry, perfect for children. At the beach it is possible to rent umbrellas and sun beds for approx. € 16 per day. The Masseria Prosperi provides horse stables, paddock and fresh forage for your horses, so feel free to bring them with you on your holiday. Moreover, nearby there is the possibility to play tennis, football and practice any water sport activities. A nice Golf Club in about 18 km distance awaits all golf lovers to play Acaya Golf Club. The breakfast service is included in your stay at Masseria Prosperi, while lunch and dinner are available only on request and with supplement. The indicative costs for dinner with drinks included are € 50 per adult and € 25 for children. For lunch the Masseria offers cold plates. Additional services are at guests disposal, to complete a nice journey in the Salento: Quad bike rental, horseback riding excursion, massages and body and beauty treatments, cooking classes, beach services, boat trips and guided tours (these extra service are available only on request). The Masseria Prosperi is glad to inform their guests, that small pets are welcome. Tourist tax – The municipality of Otranto requires the payment of a tourist tax of € 1,00 per person/overnight valid for April, May, June and September and € 1,50 per person/overnight valid for July and August. Children under 12 years are exempted and it has to be paid on spot. 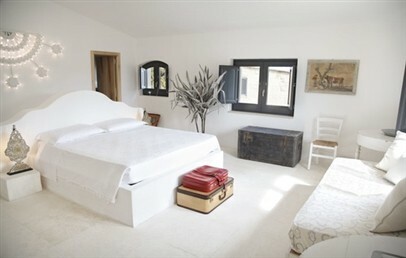 The only Classic Room of the Masseria is located in first floor and has direct access to a private terrace. It is characterized by a cosy atmosphere and refined style and presents en-suite bathroom with shower, bathrobe and complimentary toiletries with products that are not tested on animals (LAV certified: Anti-Vivisection League). 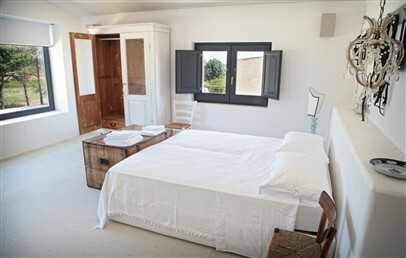 The two Superior Room of the Masseria are both located on the ground floor and have direct access to the garden. 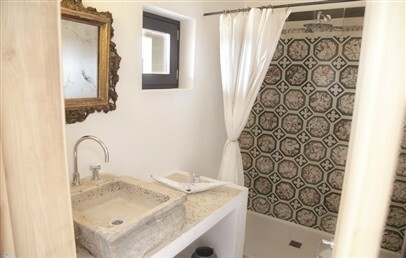 They are characterized by a cosy atmosphere and refined style and presents en-suite bathroom with tub, bathrobe and complimentary toiletries with products that are not tested on animals (LAV certified: Anti-Vivisection League).